Roy Moore, also known as the Ten Commandments judge, has been pressing toward Election Day, still leading in the polls in the race for Alabama Supreme Court Justice despite an ever-tightening run-off with his Democratic contender. Moore has been making a number of campaign stops in recent weeks, declaring a bold message regarding the state of the nation. Moore stated that at this time, Christians need to rise up and call sin exactly what it is. Vance told reporters that he believes there are more important issues to focus on than abortion and homosexuality, such as jobs. Vance’s wife, Joyce, was one of the first attorneys appointed by Barack Obama after taking office. However, most voters say that they plan to support Moore — some because of his strong stance on moral issues, and others because his name is widely recognized in the state. “Most people see him as a Godly man with strong convictions,” stated Republican state party Chairman Bill Armistead. As previously reported, in 2000, Moore ran for Chief Justice of the Alabama Supreme Court after serving as a circuit judge in Etowah County. Upon winning his bid and setting up his office in the courthouse, he arranged for a two-ton granite monument of the Ten Commandments to be displayed in the building’s rotunda, which was installed the following year. Following a battle in the 11th Circuit Court of Appeals, who ruled that the display was unconstitutional as it violated the Establishment Clause, District Court Judge Myron Thompson then ordered Moore to remove the Ten Commandments from the courthouse rotunda within fifteen days. Moore refused, but the monument was later moved to a room that was not open for public viewing. 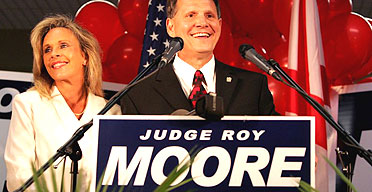 Moore has stated that if elected, he will not attempt to post the Ten Commandments in the courthouse, but will continue to assert his right to acknowledge God. Moore squares off against Vance on November 6th for what will be one the most significant Election Day observances in many states, and until then, is continuing to gather support via his campaign website.